I am so excited about this new project -- we just broke ground, so it's in the very intense beginning phase, but I know it's going to be amazing! 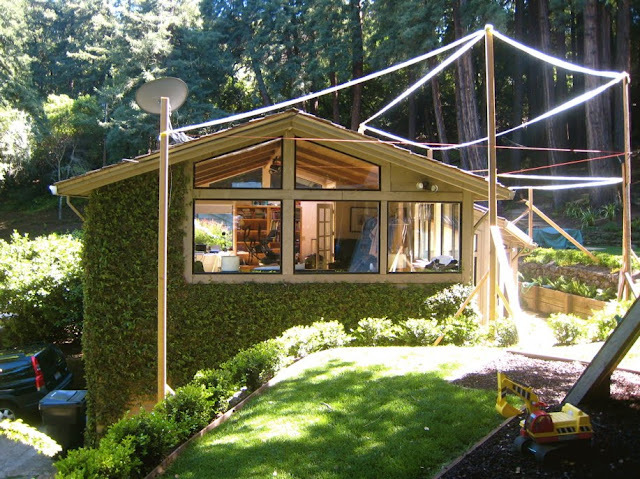 The house is in a great location, nestled into a hillside under a towering grove of redwood trees. These are the "before" photos of back and the side of the house, with story poles in place showing what we're going to build. The goal is to remove a deteriorating and poorly insulated master bedroom and garage, excavate into the hillside, and add on a new two story addition that will encompass a garage, laundry, bathroom, mechanical, and storage room on the ground floor, and master bedroom, master bath, writer's studio, and kids' playroom on the second floor. 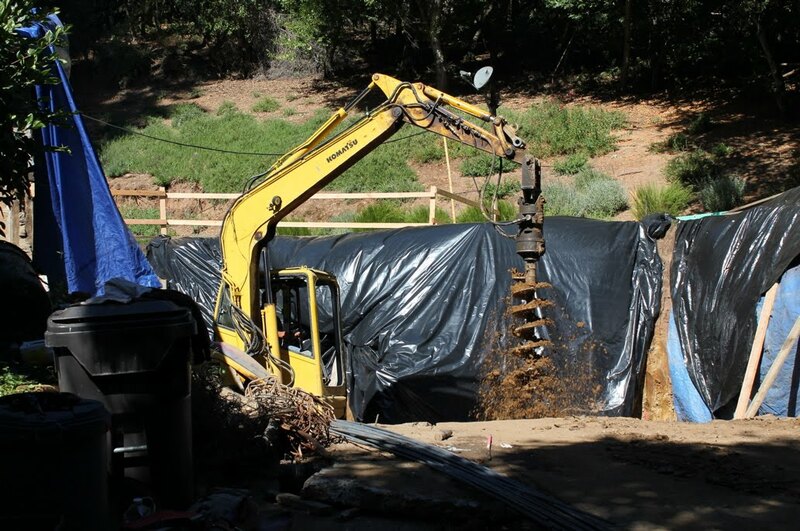 Notice the tiny backhoe ready to get started! We have already performed all the demolition and excavation, so we're left with this massive hole. To give you an idea of just how steep lot is, in this photo, I'm standing in the back yard and looking down toward the front yard. Yikes! We built safety fences all the way around the site that you can see in the background. We've just begun drilling for piers. 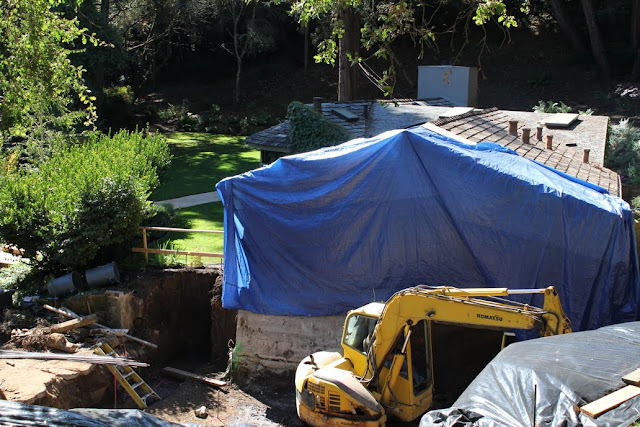 We have a total of 12 piers, going down 12-15' into bedrock to anchor the new foundation to the hillside. On the back wall where the black tarps are now, will be a 11' high concrete wall. The design of the house is rustic modern, so that's what I'll call it from here on out. It combines elements from the natural surroundings, like stone and weathered wood, with contemporary finishes, like steel and glass, to make the home seem like a cozy extension of the forest. 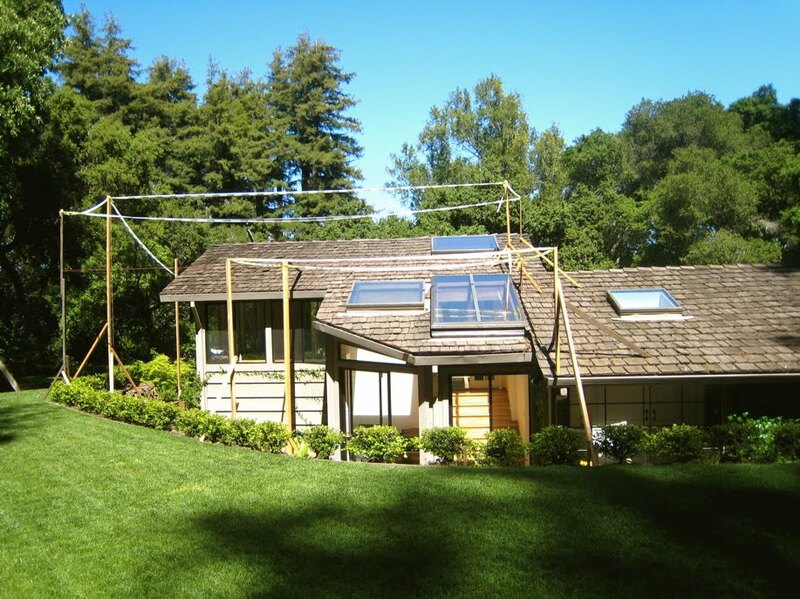 I'm starting to see more and more of this style in the wooded areas of the Northern California hills. You're going to love it!